Another new project, as if there wasn't enough going on here, but I couldn't resist. 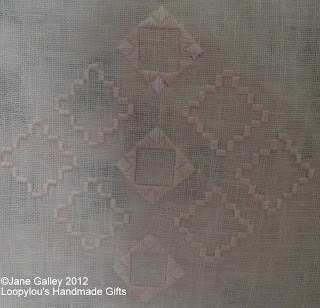 On the Yahoo Group, Stitch Specialists, there is a Hardanger SAL, designed by the group owner Abi Gurden. It's to learn the basics, and move on to the more complicated stitches involved in hardanger. This is this the first section, and once the counting was done, fairly straightforward to stitch. I'm looking forward to next month. ooh, pretty. I look forward to seeing this one grow. I can't get into Yahoo Groups, I joined a couple but nothing really happens. hardanger is such a beautiful process. I see a lot of it when I go to Sweden and it is really very beautiful. Very nice. Lovely subtle colours.